Hosted here at the University of Plymouth on Wednesday 19 May 2010 (11am to 3pm). Its FREE and lunch is included. The seminar is aimed towards academic and professional staff in HE and HE in FE who would like to use easily employed Web 2.0 technologies to support learners in work-based learning. More details and registration and further details on the presenters on our TechnologyEnhancedLearning website. Another successful elearning conference here at Plymouth University! The venue was the famous Roland Levinsky building, providing the delegates with large lecture theatres and even a cinema! Each area had a dedicated PC with large screen showing the twitter feeds for #pelc10 coming through ...so far some very positive feedback on twitter. Thanks to Dominic Martignetti (Technical Director) for his efforts in organising this element of the conference (amongst all the other techy components of course! I know he work hard on this). On the point of thanks, we must not forget Mark Lyndon's efforts, creating another excellent conference website, with inclusion of his very creative imagery! We had some very excellent key notes this year from Josie Fraser, Social and Educational Technologist and Dave White, University of Oxford. Professor Brian Chalkley, Director of Learning and Teaching, University of Plymouth, made some introductory remarks before Josie Fraser's presentation, emphasising the importance of Technology Enhanced Learning (TEL) at Plymouth and its impact on teaching and learning. Dave White's talk included elements from the TALL blog (The TALL group is part of the Department for Continuing Education at the University of Oxford). 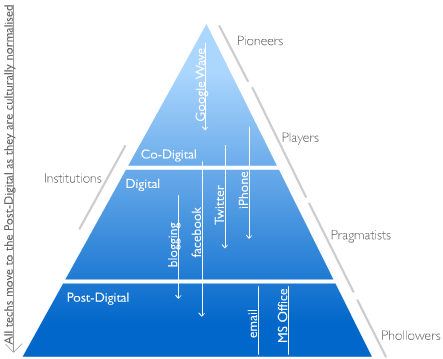 Dave also mentions his technological transition from the Co-Digital to the Post-Digital diagram, and further linking this to: 'The Hierarchy Of Digital Distractions' (select the plain diagram to see the full pyramid) that was originally posted on informationisbeautiful.net. Thought provoking stuff indeed. Shameful plug: I teamed up with Sally Holden, Luke McGowan and Paul Russell from the Peninsula College of Medicine & Dentistry, UK (based here in Plymouth University) to produce a talk entitled 'To V or not to V? that is the question' that included examples of our virtual development projects from both dentistry and the environmental sciences, to turn the session into a mini debate. Turning Point voting was also included to quiz the attendees. More information on the conference is also provided on Steve Wheeler's blog (Conference Chair), also Mark Pannell , Mark Lyndon and Flea Palmer. Some photos on flickr courtesy of Dawn Wheeler. Thank you to all those involved both on the home and international organising committees. Looking forward to next years conference! I attended the SharePoint 2010 briefing where Mandy Goss outlined plans about the implimentation of SharePoint 2010 across the University. tulip 2010/11 sites will be created using SharePoint 2010 these should be available for around the end of May 2010. The 3 year archive of tulip sites will no longer be available. 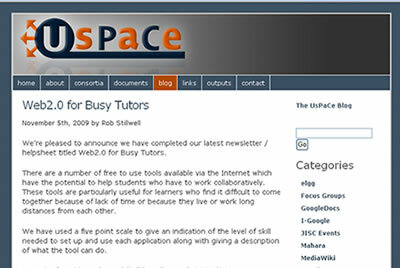 Office Communicator 2007 will roll out at the end of June, the Learning Technologists have been testing this software and there are some useful additional features. Microsoft Office 2010 is still being evaluated so no plans for implementation just yet. Further details on Sharepoint and Office 2010 can be found on the Web Team Community. The actual PowerPoint that Mandy showed us can be found on the Web Team Community (Basic overview of Summer 2010 changes and developments) - username and password required to access these slides. Are there any benefits to the new SharePoint? In-page editing with WYSIWYG interface with an editing ribbon similar to the format in the existing Office products. Social computing: tags, bookmarks, noticeboard (Similar to Facebook wall). More themes and layouts (and easier to change layouts).